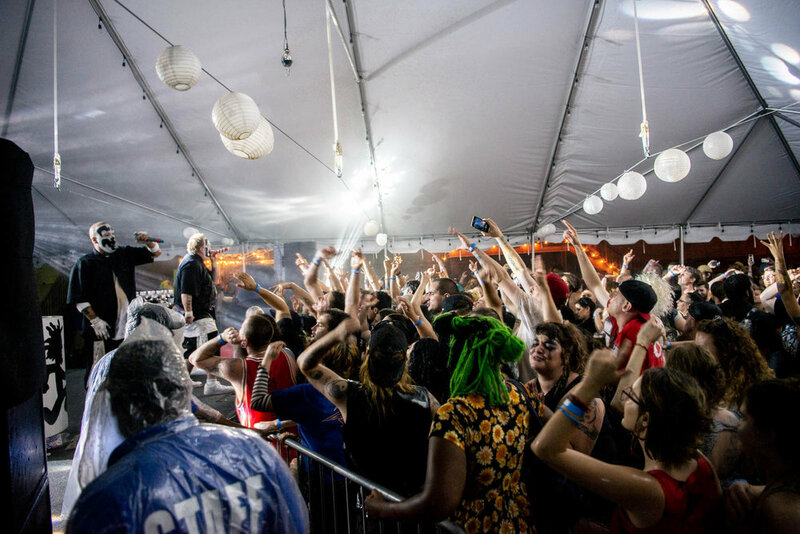 During Insane Clown Posse's performance at The Well on Friday, June 29, 2018. Writer/director Laura Steinel, an ICP fan known as Mankini (who appears in Family), and Taylor Schilling on Friday, June 29, 2018. Insane Clown Posse at The Well on Friday, June 29, 2018. On Friday, June 29, 2018, Rooftop Films presented a screening of the film Family by writer and director Laura Steinel followed by a performance of Insane Clown Posse. The event took place at The Well, the same venue ICP played in October 2017. Laura Steinel and actor Taylor Schilling introduced the film before the screening. I covered the event for BrooklynVegan and there are more photos in the gallery available here.